Schutzhund (German for “protection dog”) is a dog sport that was developed in Germany in the early 1900s as a breed suitability test for the German Shepherd Dog, to determine if a dog displayed the appropriate traits and characteristics of a proper working German Shepherd Dog. Today, it is a sport where many breeds other than German Shepherd Dogs can compete. It is a demanding test for any dog. It has had several different names, and rather than try to keep up with future changes we will use the original name, Schutzhund. It is also often called “IPO” (roughly, international working dog test). Schutzhund tests dogs for a strong desire to work, courage, intelligence, trainability, a strong bond with the handler, perseverance, and protective instinct. It also tests for physical traits such as strength, endurance, agility, and scenting ability. The sport’s goal is to reveal character and ability of a dog through training. 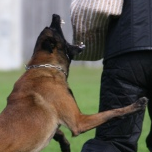 Schutzhund is a challenging test of a dog’s character, and not every dog is up to the challenge. Even breeds common in the sport have individuals that do not have the necessary drives or physical characteristics. Dogs of many breeds, even mixes, compete in schutzhund. 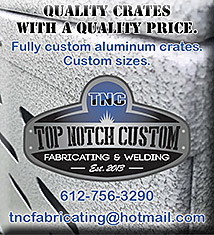 Any relatively large dog with the right temperament and physical characteristics can participate. Most common are the herding and protection breeds and large terriers. Breeds such as retrievers, setters, or pointers that are bred to have a “soft” mouth are less suitable, though occasionally you will see one in the sport. If you want to do only obedience or tracking, almost any breed, of any size, may be suitable. 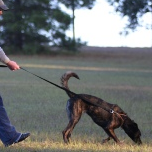 There are three phases in Schutzhund training–tracking, obedience, and protection. The sport offers many different titles and tests, but the most common involves all three phases tested on the same day. These are called Schutzhund (or IPO) 1, 2, and 3. Before a dog can compete at the 1 level, he must pass a temperament test called a BH (Begleithundprüfung, which translates as “traffic-sure companion dog test”). The BH tests basic obedience and sureness around strange people, strange dogs, traffic, and loud noises. A dog that exhibits excessive fear, distractibility, or aggression cannot pass the BH. The BH is an excellent temperament test for dogs of all breeds, and the requirements are such that any dog of any breed can participate successfully. Having your dog pass a BH test demonstrates that he is of sound character, safe to be around. You can also take a test in tracking or obedience separately, or a Schutzhund A test – obedience and protection but not tracking. The tracking phase tests not only the dog's scenting ability, but also its mental soundness and physical endurance. In the tracking phase, a track layer walks across a field, dropping several small articles along the way. The length, complexity, number of articles, and age of the track varies for each title. The obedience phase is done in a large field, with the dogs working in pairs. One dog is placed in a down position on the side of the field and its handler leaves it while the other dog works in the field. Obedience is judged on the dog's accuracy and attitude. 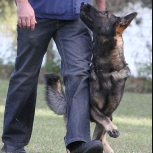 In the protection phase, the judge’s assistant, called the "helper", helps him or her test the dog's courage to protect himself and his handler and its ability to be controlled while doing so. The helper wears a heavily padded sleeve on one arm. There are several blinds, placed where the helper can hide on the field. The dog is directed to search the blinds for the helper.